The dandy of the veg patch. 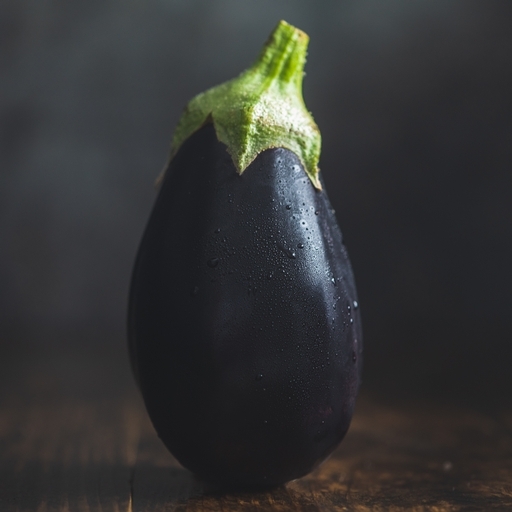 Our organic aubergines have glossy skins and sweet, firm flesh – no bitter, washed-out specimens here. This versatile veg is good for roasting, ratatouille or smoky dips. For something really sumptuous, stuff with veg, rice or couscous, top with cheese and bake until golden and bubbling. Veg that grows together, goes together. Aubergine is close friends with other Mediterranean favourites: tomatoes, basil, garlic and capers. If you pair it with those, whether in caponata, ratatouille, imam bayildi or aubergine parmiagiana, you can't go far wrong. They’re a sponge for a huge range of other flavours as well. Roast in cubes and toss with couscous, yoghurt and harissa – or lightly stir-fry with garlic, spring onions, soy sauce, wine vinegar and sesame oil. The options are practically as endless as your imagination. Keep in the fridge. They should last about a week. They can become slightly bitter the longer you keep them, but there’s no need to salt aubergines, as modern varieties are grown to be much sweeter than they used to be. The UK season usually runs from June to September. Don’t miss graffiti aubergines in late summer. They have a distinctive purple and white mottled skin and a delicate flavour. We grow aubergines on our Riverford farms during the UK season. If you’re lucky enough to find a graffiti aubergine in your box, it was grown by Adrian Izzard, a very committed organic farmer near Cambridge. The rest of the year, your aubergines come from our Spanish grower Paco Locano in sunny Almeria.